Rose Lane in St Andrews, is one of the old cobbled streets in the centre of town. The lane was the location of a small brewery, later to become a bottling factory for lemonade. Some of the original buildings still stand. South Street, one of the main streets in St Andrews can be seen at the top of the lane in this shot. 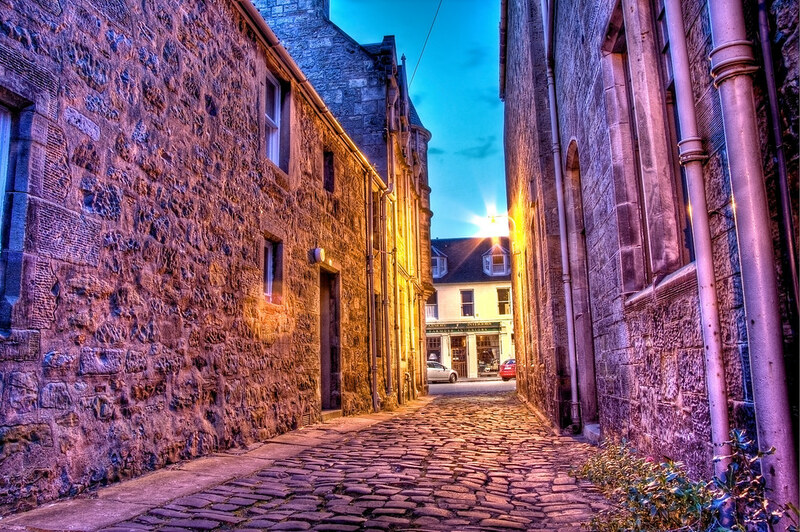 This entry was posted in Scotland, St Andrews and tagged cobbles, dusk, fife, hdr, Medieval, night, Scotland, scottish, skreid, St Andrews, street, town, urban. Bookmark the permalink. Do you realise that the doorway & house on the left of this view was where your great granny lived at 2 Rose Lane? Hi Stuart, just stumbled across your picture of Rose Lane in the process of family history research. If your great granny did live at 2 Rose Lane then I think she was my great granny’s sister. My great Granny was Annie Cameron and her sister Barbara married Alex Reid, a watchmaker, who lived at 2 Rose Lane in 1901. If this isright and if you’re interested, send me an e-mail and I’ll send you details of what I have. sorry, it would have been Flora Cameron and not Barbara. Hi Donald, I don’t really have any more information on the factory other than that there was one there. Sorry. Stuart.